The idea of bringing East Village back to life as an urban village resurfaced in 2005 – an idea and a discussion involving the City of Calgary, urban planners and the public. 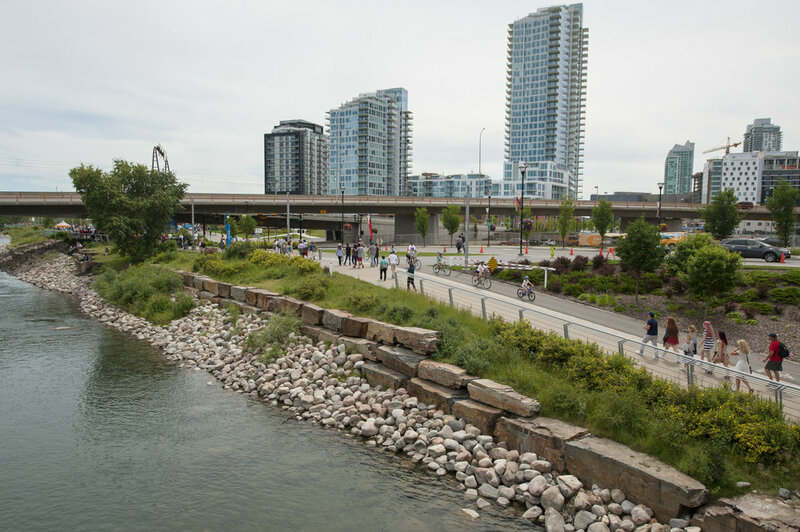 Two years later, city council created CMLC and, with a huge vote of confidence, sent us forth with the ambitious mandate to revitalize the Rivers District and, in particular, the neighbourhood of East Village. Since that time, progress has been rapid. It’s hardly surprising that East Village was where downtown Calgary first began – the site where our city was founded. In time, though, East Village fell on hard times and became well known for its vacant lots and neglected buildings. Fast forward to today. East Village is in the midst of an exciting transformation. Since 2007, CMLC’s commitment of $396 million into infrastructure and development programs has so far attracted nearly $3 billion of planned development. As developers and retailers have come to see the value of the East Village transformation, our available inventory of land has been snapped up. The infrastructure and development projects - described here and in the Partners section - all materialized as a direct result of CMLC’s passion, focus and determination to succeed in fulfilling our mandate. It’s a new era for East Village – and an exciting future for urban living in Calgary! Guiding our redevelopment efforts is the East Village Master Plan, authored with the help of Broadway Malyan. This British firm – one of the world’s top architectural practices – was the unanimous choice in the international competition CMLC organized in 2008 to find an urban design practice to provide advice on the master plan. Inspired by some of the world’s most liveable places, Broadway Malyan’s 2009 master plan established the framework for redeveloping East Village into a vibrant, mixed-use, creative city neighbourhood – an urban village and one of the most dynamic areas within Calgary’s downtown core.